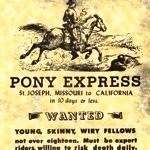 On this date in 1860, the Pony Express postal service started when riders left St. Joseph, Mo., and Sacramento, Calif., at the same time on 2,000-mile trips. The first trip west took 9 days and 23 hours, and trip east took 11 days and 12 hours. Today, when you can talk with people on the other side of the planet in real time, describe your favorite method of communication and why you prefer it.